Plastics technology is a diverse subject. Plastics engineers have many opportunities. Plastics engineers deal with the numerous possibilities for manufacturing sustainable and innovative products from plastics. 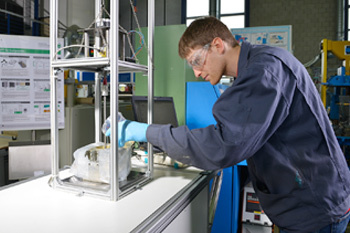 In the bachelor's and master's courses, students learn the respective properties of the different plastics and their various processing techniques. They also find out what special requirements have to be considered when designing and producing plastic components. Plastic is THE material of the 20th and 21st centuries, and is nowadays found in absolutely all walks of life: beverage packs, spectacle lenses, toothbrushes, window frames, pipes, DVDs, smartphones, computers, cable sheathings, wind power plants, dashboards, car tyres, wound dressings and implants are just a few examples. Because of their versatility and flexibility, plastics are virtually irreplaceable in innumerable applications. Plastics technology therefore deals with the design and production of plastic parts for high-tech applications and also for consumer goods in everyday life. Plastics engineers are tasked with developing sustainable and economical solutions to solve all kinds of problems. They design and manufacture both micro-components and giant hollow articles. And they know how to deploy processes for both mass production and for customised ultra-small series. Acquiring detailed knowledge of the various plastics, their properties and their behaviour during processing as well as their recycling characteristics constitutes a fundamental part of the course. Skilful utilisation of the different production processes plus a product design that is compatible with the particular type of plastic allows the plastics to develop their full potential. They are the material of choice for sustainable products tailored to customers' needs in all areas of life. IKV provides engineers with comprehensive training to allow them now and in the future to develop sustainable, resource-saving products from this versatile material. The central element for the course are the lectures, which are given by the head of the Institute, Prof. Dr.-Ing. Christian Hopmann, by other members of the IKV management and department heads, and by external lecturers from industry. All the lectures are supplemented by practical exercises in IKV's laboratories and pilot plants so that the students are acquainted as early as possible with the practical side of the subject. Equally important are the scientific papers written by the students at IKV. They are always edited in close coordination with IKV's working groups and post-graduates, bringing the students closer to the real issues in industry and science. The results of the students' papers make a direct contribution to driving research projects at IKV, and are an important pillar of the scientific work at IKV. The Plastics Technology course at IKV reflects the enormous variety of issues connected with plastics. From the initial production of the material, via the stages of design and simulation, to the final manufacture of the product, the lectures and practical exercises cover all the fields of plastics technology. Guided by the scientific assistants at IKV, students write a number of different papers at the Institute. In addition to bachelor's and master's dissertations, students also deal with related topics in the form of project or research laboratory papers. The subjects are always connected with practical situations in industry and science. Look up current topics that can be tackled.